As a music buff who is primarily a jazz fan, I have to say that I’m jealous of the Rock and Roll Hall of Fame & Museum. True, there is the National Jazz Museum in Harlem, within walking distance of my apartment uptown, and it’s not only a more modest enterprise, but one that, out of necessity, takes a completely different approach. 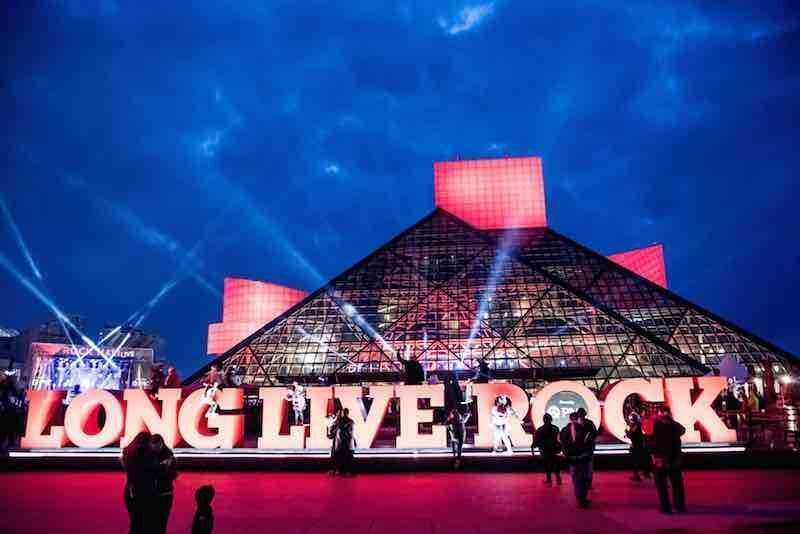 To visit the stately marble halls that house the Rock and Roll Hall of Fame & Museum, in Cleveland, is to be overwhelmed by the way that, unique in rock and pop, the auditory sensations are directly connected to the visual stimulation - in a way that just doesn’t happen in jazz. In rock and roll, every band seems to have its own signature look, it’s own signature costumery, it’s own specialized instruments. It’s true that every rock band every essentially consists of guitars and more guitars. (And then there’s bass guitars, but no, not a lot of great rock clarinetists or brass players - and the market is still open for the first superstar heavy metal accordionist.) Perhaps the instrumental uniformity is what drove rock musicians to make all those guitars look somehow different visually. In rock, the instruments are also part of the wardrobe. The clothing worn by say, any of the flower child bands of the late 1960s is different from the “Nudie” suits worn by the rockabilly stars of ten years earlier, which are themselves different from the instruments and stage clothing from any other era. In jazz, it just isn’t so much: Louis Armstrong’s tuxedo looks exactly like Dave Brubeck’s tuxedo and Lester Young’s tenor saxophone is visually indistinguishable from John Coltrane’s tenor saxophone (except possibly, to another tenor saxophonist). Even during the big band era, when the swing bandleaders were, essentially, the rock stars of their day, Benny Goodman’s orchestra wore the same white dinner jackets as Count Basie or a thousand other bands. There are occasional outliers: Dizzy Gillespie’s upturned trumpet, say, and the quasi-African dashikis that Miles Davis began wearing (partly to signify, one suspects, that the tuxedo era of jazz was over), but no one can claim that those visual signifiers contribute to the music the same way that they do in rock. More than jazz, it’s a fully Proustian experience, which incorporates hundreds of minute signifiers, these petite madelines in the form of lunchboxes, t-shirts, and roach clips, as it were. The Rock and Roll Hall of Fame & Museum Leaves An Impression! The Rock & Roll Hall of Fame & Museum takes full advantage of this; here, not only the clothing and implements, but the memorabilia, the ephemera, the tchotchkes, and the bric a brac, are fully part and parcel of the experience in a way that’s unique to rock. The Hall is thoughtfully organized: the history of the music is laid out in a way that overlays the whole works in a grid that’s at once chronological and geographic. It’s the calender meets Google maps: London in the early 1960s vs. San Francisco and Haight-Ashbury in the late 1960s vs. Motown at roughly the same time. In sampling everything from Billy Joel’s original lyric sheets to Elvis Presley’s motorcycle (described by the HoF as his “red and gold SuperTrike”) one walks away with a full and satisfying experience of what the music really means, both in its time and since. And whatever part of the story the physical effects don’t tell is conveyed in audio and video; there are more screens and multimedia here than in any installation you’ve ever seen. Like I say, I’m much more of a jazz fan than a rock and roll guy, but even I plan to visit this amazing institution in Cleveland as frequently as possible. Between two visits (2010 and 2018) I’ve already spent about a total of 12 hours there, and that’s not nearly enough. PS: Now a Broadway Hall of Fame Museum... Now that’s something that really could work!